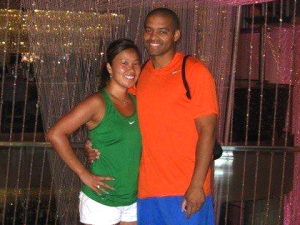 IRVINE — A fired Los Angeles Police Department officer was identified tonight as the suspect in the fatal shootings of a college basketball coach and her fiance, a university public safety officer, found dead in an Irvine parking garage. Christopher Jordan Dorner of La Palma was represented in the hearing that resulted in his firing by Randy Quan, the father of Monica Quan, 28, slain with Keith Lawrence, 27, Irvine Police Department Chief David Maggard said at a news conference. Dorner posted a multi-page manifesto online Monday, saying he didn’t mind dying, because he died on Jan. 2, 2009, the day he was fired from the LAPD, Maggard said. Dorner blamed Randy Quan, a retired LAPD officer, for his firing. “I never had the opportunity to have a family of my own … (so) I am terminating yours,” Dorner wrote to Randy Quan. The LAPD’s elite Metropolitan squad was sent to protect others mentioned in Dorner’s manifesto. Dorner worked “as a police officer from Feb. 7, 2002 until Sept. 4, 2008, when his employment was terminated,” police said. 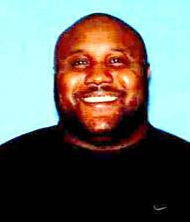 Dorner is 6 feet tall and weighs 270 pounds, and was driving a blue 2005 Nissan Titan pickup with the California license plate 7X03191, Maggard said. Dorner, who is likely armed and dangerous, was being sought by Irvine police, the LAPD, the FBI and U.S. Marshals Service. He may be anywhere between Los Angeles and San Diego, Maggard said. Autopsies on the bodies of Lawrence and Quan were completed Tuesday and Wednesday, respectively, Jim Amormino of the Orange County Sheriff’s Department said an an earlier press conference. Police who received a call at 9:10 p.m. Sunday about a person slumped over in a parked car at 2100 Scholarship found the recently engaged couple dead in Lawrence’s Kia, which was parked at the top of the five-story structure for the building where they lived. Irvine police Lt. Julia Engen said there was no evidence they were being robbed, and noted that the high-density residential community is highly secure with keycard access only. Quan was an assistant coach for the Cal State Fullerton women’s basketball team, and before that was an assistant coach at California Lutheran University in Thousand Oaks. Dow recalled how he would receive calls from Quan when she was away from work about a unique play she saw during a game on television or to tell him a documentary was being aired about the University of Connecticut women’s basketball team. Quan rooted for the Lakers, but was a big Michael Jordan fan and had an “incredible collection of Nike sneakers,” Dow said. When they would take recruits around campus, Dow would stay on the campus sidewalks because Quan “was absolutely loathe to walk on the grass and get her sneakers dirty,” the coach recalled. Dow said Quan called him about a week ago to tell him about her engagement to Lawrence. “She was a very private person, and she told me she didn’t want me to hear it through the grapevine,” Dow said. The couple met while at Concordia University in Irvine, where they both played basketball, Dow said. Lawrence was seeking a career in law enforcement, which made him a good match for Quan since her father was an LAPD officer, Dow said. Dow said Quan recruited the current seniors on the California Lutheran team. Lawrence, who graduated from the Ventura County Sheriff’s Academy, was working as a patrol officer at USC’s Department of Public Safety. He joined the department in August, said Carl Marziali, USC’s assistant vice president of media relations. John Thomas, the chief of USC’s Department of Public Safety, issued a statement to his officers Tuesday, calling the murders “senseless” and asking for their “thoughts and prayers” for the victims’ families and friends. Foster added, “A really bright light was put out way too soon. Someone whose passion was impacting young women with the game of basketball. Quan, a star athlete at Walnut High School, played basketball at Cal State Long Beach from 2003-05 before transferring to Concordia University in Irvine, where she graduated in 2007 with a degree in exercise and sports science. In 2009, she earned a master’s degree.